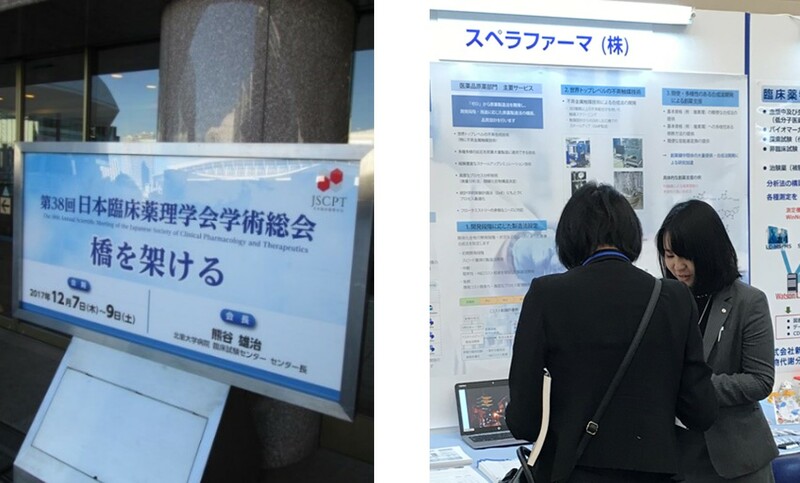 Spera Pharma exhibited at The 38th Annual Scientific Meeting of the Japanese Society of Clinical Pharmacology and Therapeutics | Spera Pharma, Inc.
Spera Pharma exhibited a company’s booth at The 38th Annual Scientific Meeting of the Japanese Society of Clinical Pharmacology and Therapeutics, which was held for three days from December 7, 2017 at PACIFICO Yokohama. Many attendees from universities and hospitals engaging in clinical research visited the booth and showed their interest in Spera’s technical services from early stage development, such as synthetic method development of APIs (active pharmaceutical ingredients) and quality design. A sales department member who managed the booth remarked that, “I felt that great efforts to develop new medicines and therapy through clinical research have been made, actively and enthusiastically at numerous sites”, “I want to act positively so that the unique Spera technical services will further contribute to the progress of clinical research”. We greatly appreciated all the visits to our booth and will continue to do our best to respond to all of the expectations of Spera Pharma .